Home. Spent our Easter break back in Mill Valley feeling very much at home. Hanging out with friends, revisiting favorite places and restaurants, cycling, hiking, drinking coffee at Peets & Equator - All good. Its a special place to us. We immediately made friends and fell in love with the beautiful landscapes, the mild weather and the Golden Gate Bridge when we lived there, so off course we miss this special place. What is so special about it? Let me show you some photos from this trip that might explain better. 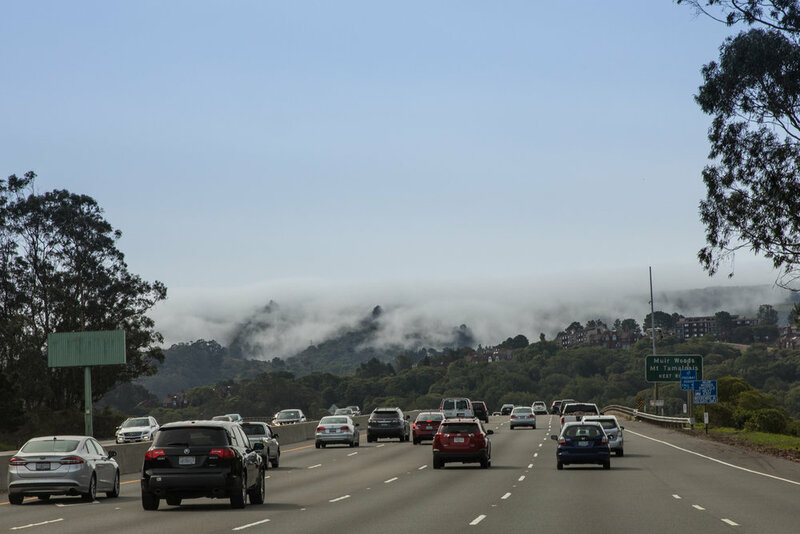 First the mountain which towers over Marin County and which Mill Valley sits upon. I love to spend time up there. The views are spectacular. You see the Pacific, San Francisco and the bay area and just the tip of the Golden Gate Bridge. My favorite place is right there on the photos above. You see that tree in the middle on the top (left)? There is a bench of stone underneath it and now there is also a swing. A good place to picnic. We have been on numerous amazing hikes around here and watched many sunsets. It is only 30 min drive from Mill Valley. The headlands is the first part of Marin county that sticks out into the Pacific and stretches from the Golden Gate Bridge to Mill Valley. If you drive from Golden Gate Bridge to the top of Hawk Hill you will have awesome views on a clear day and sunsets are amazing. It can get crowded up there and almost impossible to park near the bridge, but totally worth it. The light on San Francisco is great from this side. In the morning go to the other side below the bridge and have morning coffee at Cavallo Point or head to CIBO in Sausalito. We also did a nice hike by Rodeo Beach which is at the end of the valley you see on the photo with the painted walls and we discovered a new great viewpoint. William has been on two summercamps by Rodeo Beach and he told us quite a bit about the animals there and places he had been. To get to Stinson Beach you have to drive over Mt. Tam or drive through the quaint town of Fairfax. Highway 1 is still under reconstruction from a mudslide before Stinson beach. Its the locals favorite beach and can be very crowded when it is hot, but not this time. We enjoyed walking on the beach and meeting up with Henning & Dave on their cycling trip. We did actually meet them earlier on the top of Mt. Tam, where we tested a Dji Mavic Air drone following them. A lot of fun and lots to learn for future projects. The best place for tacos and combucha is the Sirene cafe, but it was unfortunately closed that day. Instead we had coffee at Parkside. Besides wonderful people, Mill Valley has many nice restaurants and a good atmosphere. I like all the redwood trees and steps around downtown. You can actually hike all the way from Mill Valley to Stinson Beach. Its called the Dipsea hike and there is a yearly run too. We hiked it once and it is a beautiful trail through a very varied landscape. Its also hard with very few flat stretches. It is around 7 miles long. Downtown there is a square downtown with nice shops around and there are often interesting things going on like the Memorial Parade, the Art festival or the Film Festival. It got time to head home to Denmark from our Mill Valley home. So great to catch up! We spent the last few hours in San Francisco - watching the fog hanging over the Headlands and the Golden Gate Bridge, enjoying the sight of Dolphins in the bay (you can just see the fin sticking up in the water here), exploring Fort Point and enjoying icecream at Swensens and windowshopping at Fillmore St. Already looking forward to next time! If you ever need tips for visiting this area you are welcome to get in touch. Its an awesome place with so much to see and do and eat!